Baker, G.R., A. MacIntosh-Murray, C. Porcellato, L. Dionne, K. Stelmacovich and K. Born. 2008. "Henry Ford Health System." High Performing Healthcare Systems: Delivering Quality by Design. 185-214. Toronto: Longwoods Publishing. • Order the printed paperback version or the PDF version here. Nancy Schlichting had good reason to claim success for the Henry Ford Health System (HFHS). For example, the Henry Ford Hospital was included in Solucient's 2005 list of 100 Top Hospitals: Performance Improvement Leaders (Center for Healthcare Improvement 2005) and it "earned $46.5 million on net patient revenue of $728.7 million in 2005, compared with a loss of $27.5 million on net revenue of $461 million in 2001" (Wilson 2006: 24). 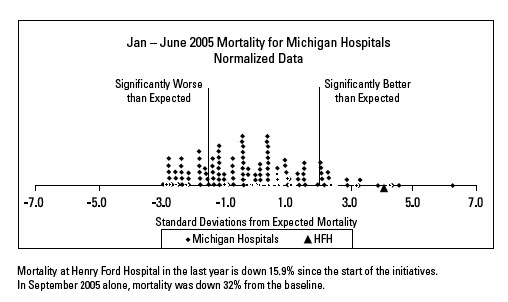 "Henry Ford's leap onto the list of most improved hospitals for the first time occurred as a result of a comprehensive strategy involving cuts, growth strategies, and improvements in clinical quality" (Wilson 2006: 25). HFHS won an initial planning grant from the IHI-Robert Wood Johnson Foundation Pursuing Perfection project in 2001. Despite not receiving funding in the second phase of applications, HFHS went ahead with seven HFHS Pursuing Perfection projects, including a depression management project. This team (the Blues Busters) started with meetings every Saturday morning (held around the medical director's kitchen table) and in the evenings; much of the work was done on team members' own time. The team has achieved significant success in meeting their goal of "no suicides" in the HFHS (see Figure 1). Each team member was assigned to a project area that matched their skills, and they formed their own teams to map processes and identify barriers. Team members made significant changes to all processes: they looked at depression as a chronic illness; developed care guidelines with detailed tools, checklists and protocols; and trained all therapists in cognitive behavioural therapy. The culture shifted such that now their goal for any project they undertake is 100%; as described by the director of quality for behavioural health: "We don't make it every time, but that is our ultimate goal." In 2004 HFHS and the Big Three automobile companies launched a major initiative to improve management of heart failure, coronary artery disease, diabetes and depression. Led by an experienced physician, the demonstration project emphasizes clinical microsystem redesign (Mohr and Batalden 2002) and the implementation of electronic prescribing in clinics. The focus is on at-risk patients whose disease conditions are not under control because of risk factors such as blood pressure, glucose, obesity, smoking and medication use. The project's goals are to facilitate patient self-management and avoid in-patient readmissions through better-integrated care paths. Care design teams, each with a project manager, prepare and implement changes that will be rolled out through the system. The e-prescribing project demonstrates decreased paper costs, reduced adverse drug events and errors and increased prescription of generics. HFHS' most recent successes were achieved by a health system operating in a very constrained context. However, HFHS' senior leaders have an emphatic message for staff members: "We are not, and never will be, a victim of our circumstances and the conditions around us" (Chief Operating Officer [COO] Bob Riney) (Henry Ford Health System 2006). HFHS is a non-profit healthcare enterprise based in Detroit, Michigan. It provides care to more than one million residents in the southeast part of the state. Founded by Henry Ford in 1915, HFHS was modelled after the Mayo Clinic as a healing environment with a focus on innovation. It includes seven hospitals - ranging from a 100-bed mental health facility to the 903-bed Henry Ford tertiary care teaching hospital - as part of a comprehensive integrated system providing primary, preventive, acute and specialty services. The diverse community-based services comprise 24 ambulatory care centres that include four free-standing emergency departments, ambulatory pharmacies, cancer centres, multiple eye care centres, nursing homes, hospice services and home care. A 16-member board of trustees governs the system, assisted by over 220 volunteer community representatives on advisory and affiliate boards. Over 900 physicians and researchers in the Henry Ford Medical Group staff the Henry Ford Hospital and 24 medical centres. It is one of the largest medical group practices in the United States (US). In addition, several member hospitals and medical centres are staffed by over 1,000 community-based private physicians associated with HFHS. HFHS is affiliated with Wayne State University's medical school. HFHS' research arm, originally started with a Ford Foundation grant of $50 million, is now self-sustaining and brought in $55 million in grants from outside sources in 2005. The Health Alliance Plan (HAP) covers 3,000 employer groups and 550,000 members in managed care and health insurance programs. HAP members receive care both within the HFHS and from external providers. In 2004 and 2005 it earned the National Committee for Quality Assurance's Excellent Accreditation status (Health Alliance Plan nd). HFHS operates in a very competitive environment in southeast Michigan, marked by a struggling economy and flat population growth. The local economy is driven by the Big Three automobile manufacturing companies, leaving HFHS vulnerable to fluctuations in their financial situations. As the companies lose market share and cut jobs, employees lose their benefits, including HAP membership. As a consequence HFHS loses income from HAP premiums and is called upon to provide unreimbursed care to a growing number of uninsured patients. Medicare and Medicaid payment cuts and flat third-party payments also contribute to the fiscal challenges. Both Henry Ford Hospital and the system's corporate headquarters are located in downtown Detroit, a city that has suffered from the automobile companies' economic woes. This is a difficult location to which to attract patients from the better-off suburban populations. However, the geographic spread and diversity of HFHS locations in the region help to counter this challenge. The decision to locate the system's corporate headquarters in downtown Detroit is seen as an investment - and vote of confidence - in the downtown community. In the face of so many challenges, how is HFHS realizing its goals and making such outstanding achievements? In May 2006 a team of researchers from the University of Toronto's Department of Health Policy, Management and Evaluation visited HFHS. This site visit was part of an initiative called Quality by Design, which aims to identify and define elements of healthcare systems capable of improvement with a view to helping to inform strategic investments in improvement capability in Ontario. Quality by Design is funded primarily by the Ontario Ministry of Health and Long-Term Care in partnership with the University of Toronto's Department of Health Policy, Management and Evaluation. HFHS was one of five healthcare systems selected from a short list of high-performing systems nominated by a panel of international leaders and experts. In Detroit the team met with and interviewed administrative and clinical leaders and improvement team leaders and members, as well as support staff working to make improvements. This case study highlights the findings of that site visit. Nancy Schlichting became chief executive officer (CEO) in 2003 (from 1998 to 2003 she was executive vice-president and COO). Under her leadership HFHS has adopted a strategy of integrating and aligning the system's various component organizations and activities. Examples of the integration efforts include streamlining the system's governance structure and work under way to extend the electronic health record across the whole system. HFHS is also building another significant structure - the HFHS Strategic Framework - as part of its drive to align individual and organizational efforts across the system. These areas are visually represented in a diagram as seven pillars supporting HFHS' mission and vision (see Figure 2). The system was restructured with cross-functional teams accountable for each of the seven pillars and HFHS executive leaders both acting as chairs and participating as members of the teams. For example, the CEO chairs the Growth and Service Excellence committees while the COO and chief quality officer co-chair the Quality Forum. The annual strategic plan and performance reporting systems are explicitly tied to the seven pillars. A monthly Dashboard Report reviewed by 100 executives and managers and their leadership teams includes graphs of measures and targets for financial performance, growth, nurse and physician turnover (people) and patient satisfaction (service). Key quality and safety performance measures and targets are derived from the six Institute of Medicine aims (safe, timely, efficient, effective, equitable and patient-centred care) (see Table 1). The performance-awards incentive structure (bonuses) for both unit-level groups of employees and individual physician employees is based on achieving the financial and patient satisfaction goals across the system. Culture of safety: % favorable ratings on two specific questions within the Employee Opinion Survey: 1) Senior management shows patient safety is a top priority, and 2) Employees are encouraged to speak up about patient safety concerns. Source: Provided by HFHS. Used by permission. HFHS has undertaken a self-assessment against the Baldrige criteria and is working toward applying for the award. Teams led by senior executives were struck to carry out the self-assessment for each category. In the words of one senior administrator: "What this has done is validate that we're doing all the right things, that quality improvement is part and parcel with every other thing we do and it's not this separate activity. ... Nobody believed it ever was, but there are still some behaviors that suggest that some people might think it's a parallel path, but it all goes together." This strategic framework includes a focus on system growth. As they construct new buildings and add services, and as volumes increase, system leaders evaluate the impact these innovations will have on quality and safety as well as on the other performance pillars. A focus on quality and safety improvement is integrated into HFHS' strategic plan, with an emphasis on performance improvement and measurement across all seven pillars. "The focus on quality," one senior administrator noted, "has re-engaged the workforce." HFHS' Strategic Framework has become the focus of cascading communication about the strategic goals throughout the entire organization, featuring huge kick-off events attended by all managers and followed by discussion of a video outlining the key goals in every unit and department. The importance of customer service and excellence across HFHS is represented in the diagram by the "Lance Armstrong-like band" labelled The Henry Ford Experience that wraps around all seven pillars. As Chief Medical Officer Dr. Mark Kelley put it, "The Henry Ford Experience is about excellence in all that we do. ... Patients want a totally positive experience from start to finish." Internal system alignment is required to accomplish this goal in order to coordinate, in Kelley's words, "services and product lines so quality and service are the same system-wide." Kelley also noted the need to find "innovative ways to share information" and best practices across HFHS so staff and units can learn from each other (Henry Ford Health System 2006). "We are investing in culture and the people, namely, how you select, orient and develop people. There are programs about service and quality, not just clinical quality, but quality principles more broadly." All HFHS employees participate in an organizational development initiative called Renewal, which is a two-day, off-site experience. The program emphasizes the influence of role models by using a concept known as "the shadow of a leader," a phrase mentioned by both managers and staff members. Three quarters of HFHS employees have completed Renewal, and two-hour refresher modules are in development. According to one project manager, "It was a powerful opportunity to reflect on your own values and the organization's values, personalities, your strengths and weaknesses as a person, and how your contribution fits with the greater organization/system. ... It helps you recognize what your filters are, that filter what you hear." The importance of service excellence is a recurring theme at HFHS. At Wyandotte Hospital (350 beds), for example, the CEO takes a hands-on approach to leading the service excellence process. He speaks of the need to align accountability with the seven pillars using "major metrics of service excellence to tie back to remuneration" in order to "hardwire this in." He also participates in new employee orientation and personally does rounds, thereby maintaining a visible presence throughout the hospital. And he advocates an approach developed by the Studer Group (executive coaching and organizational development consultants; see https://www.studergroup.com) and uses their terminology, including the "nine principles" and "six must-haves." The "key drivers," he emphasizes, are culture, commitment, consistency, communication, reinforcement and acceptance. The Wyandotte CEO commented, however, that the HFHS CEO "did not altogether buy in to the Studer model" at the beginning and "it was not a slam-dunk getting others to buy in and be interested." With the increased emphasis on service excellence, each business unit appointed a service excellence administrator to help spearhead the efforts. The service excellence work at Wyandotte began a few years ago during a merger and cost-cutting (and employees' resulting anger about both), yet it has raised employee and patient satisfaction scores (the former, dramatically). However, when asked where the CEO thought the hospital was on its development trajectory, "about halfway" was the reply. All Wyandotte management meetings begin with discussion of service excellence issues. In the context of attracting community physicians (who are independent contractors and not part of the HFHS practice group), they talk about "treating physicians as our customers" and "improving processes that make it easier for them to practice here." Service excellence teams, overseen by a steering committee, are working on behavioural excellence, leadership development, reward and recognition, physician satisfaction and employee satisfaction. The Satisfaction, Measurement, and Resource Team (SMaRT), for example, acts as a resource for departments to help them interpret patient satisfaction survey results, to identify successes and opportunities for improvement and to implement a tool for measuring internal customer satisfaction. They call their quality improvement process ICAST (identify, collect data, analyze, study, test), an acronym that links to "the shadow of a leader" Renewal concept. HFHS uses Press Ganey for patient satisfaction surveying and Gantz Wiley for annual employee surveys. Both patient and staff satisfaction have become key metrics for individual departments, business units and the system as a whole. As an example, Fairlane Medical Center's emergency department in Dearborn had the system's poorest patient satisfaction scores (28th percentile), the longest length of stay and "a reputation as a place where you should not send patients," recalled the emergency department's medical director. After consulting with staff, Fairlane began in 2003 to redesign the department's triage and registration processes. This redesign process began with setting up a team of staff volunteers who worked to "sell the changes to their colleagues." Senior management also made all staff members aware of the patient satisfaction scores, held quarterly reviews, discussed specific questions and scores with staff, sought ideas about how to fix the problems and helped to implement them. Wait times dropped from 120 to 40 minutes and overall satisfaction ratings rose from 77.9 to 88.3 over two years. When scores improved Fairlane staff celebrated: All the nurses were given "really good stethoscopes" and the registration staff received cardigans. Fairlane emergency department's medical director referred to the HFHS Renewal program and "the shadow of a leader" concept when talking about the powerful influence of role models. He reported that his door is always open to any staff member and Fairlane's organizational structure is very flat, allowing the director to spend time discussing with staff members how they fit in with the "greater scheme of things and the HFHS strategy." He emphasized the way improved patient satisfaction increases volumes, which improves hospital finances, which in turn means Fairlane will have the means to do what is needed to make it easier to improve care. Fairlane also developed an emergency department performance guarantee, which documents the department's values and how staff members put patient expectations into action (see Figure 3). All new staff members participate in a ceremony of signing a poster-sized copy of the guarantee, which displayed in a case in the lobby where patients can see it. HFHS has a corporate Office of Clinical Quality and Safety (OCQS), which has sections covering regulatory issues, infection control, risk management, patient satisfaction, medical informatics and quality and safety initiatives. The office has approximately 35 staff with a budget of about $3.5 million (including the quality staff for HFH as well as system-level coordination of quality improvement initiatives and infection control at the various sites). Our reputation is the most valuable thing we own. Dedicate myself to Clinical Excellence and Exceptional Patient Service. I am here to help people feel and get better. Treat you with kindness. Patients are scared and vulnerable. Be gentle. Tell you what to expect. Provide physical comfort. Smile appropriately and provide eye contact. Be respectful and courteous at all times. Keep your family informed. Patients put their trust in me. Treat your problems seriously and efficiently. Satisfy your personal needs. Patients must know that I care about them as individuals. Ignore no one. Listen attentively. Show respect for all cultures and backgrounds. Patients' time must be respected. Work quickly and efficiently to do my best. I am part of a team. Promote patient satisfaction by working as a team member with other Fairlane employees and medical staff. Assume responsibility for what another is unable to accomplish. Do what I say I will and do it well every time. Never make excuses. I represent the Fairlane Emergency Department and I am responsible for solving problems. Take the initiative to solve problems, not point fingers. Seek an appropriate time and place for discussing sensitive issues/frustrations. Great things happen when we listen to our patients and to each other. Always make time to listen. I may someday be a patient. Treat patients and their families as I would like to be treated. Source: Medical Director, Emergency Department, Fairlane Medical Center. Used by permission. OCQS is co-led by long-time HFHS staff members: the chief quality officer (CQO) and a vice-president of planning and performance improvement. The CQO, a respected and experienced clinician who also serves as Henry Ford Hospital's chief medical officer, and the vice-president, who has an industrial engineering background, make an effective leadership team; with this pairing, noted the CEO, "We now have the right leadership for quality initiatives." Likewise, the OCQS department directors each have at least 10-plus years' experience at HFHS and are very knowledgeable about clinical improvement methods. The office also includes an infectious disease physician, a physician involved in internal medicine residency education and quality improvement, and a statistician who supports quality initiatives such as 100k Lives. In addition, a separate Management Services group includes a dozen industrial engineering, operations (clinicians with management experience) and management consulting staff members whose focus is process design. The vice-president of planning and performance improvement described the group's role as providing "the science side of improvement" and "implementation support." The Management Services group earlier charged users for its services, although this bill-back practice was discontinued around 2004. OCQS and Management Services used to be two separate silos but were brought together under the vice-president, who commented, "We have not yet been asked to cost-justify the quality work. Again, I think it is recognized that this is necessary work." So much so that in the midst of other cuts during an earlier financial crisis, HFHS kept its OCQS staff to support quality initiative projects and work as well as increased the bedside nursing complement and staffing ratios. OCQS staff members also respond to numerous regulatory and external reporting requirements. Internal practices must be audited against standards produced by multiple agencies, and compliance must be documented. For example, the National Quality Forum (NQF) has published Safe Practices for Better Healthcare (2003). Preparation for accreditation processes, including the Joint Commission on Accreditation of Healthcare Organizations (JCAHO), is no longer a once-in-three-years effort; JCAHO surveyors can drop by unannounced, as they did recently at HFHS. Although such visits create a lot of work, they can provide an impetus for positive change. "We get a lot of work that crosses boundaries, like the system policy work," noted one of the OCQS directors. The System Quality Forum comprises HFHS' senior leadership team related to quality and is responsible for the quality and safety pillar in the HFHS Strategic Framework. It is co-chaired by the COO and CQO, includes HFHS' CEO, all chiefs (e.g., medical, nursing), all quality directors from across HFHS, the CEO of every business unit (e.g., hospitals and ambulatory sites), the chief medical officer (who acts as CEO of the Henry Ford Medical Group) and the vice-president of planning and performance improvement. The forum had been meeting quarterly but, as one member put it, "The CEO said we should meet monthly; if we are meeting monthly to discuss growth and service, we should meet monthly to discuss quality. ... It is our way of getting very systemic in our approach, and reporting the right things to our board." OCQS directors noted that the forum has been transformed; people leave with to-do lists and a sense of ownership, taking responsibility for doing something about problems. The annual Quality Expo has been held for 15 years at HFHS. Staff members apply to present their improvement projects in a storyboard format, categorized by the six Institute of Medicine aims mentioned earlier in connection with HFHS' New Strategic Framework (safe, timely, efficient, effective, equitable and patient-centred care). Books of project descriptions are published each year (approximately 80 initiatives). External judges review the storyboards, and prizes are awarded and ribbons placed on posters that demonstrate good examples of teamwork and flow diagrams as well as on ones that follow quality management principles. Quality Expo is an opportunity for staff to learn about and celebrate successful changes. In addition, it helps reinforce the need to practise process improvement techniques such as the IHI's Plan-Do-Study-Act (PDSA), because submissions must describe the various cycles of improvement that teams went through to achieve improvements. Efforts to formally structure improvement at HFHS began in 1988 with the introduction of a total quality management (TQM) approach under then-CEO Gail Warden and Senior Vice-President Vinod Sahney. Sahney and Warden have written extensively about this experience, chronicling the decision to pursue TQM, how they learned about the concepts from industry, how they adapted them to healthcare and the intensity of efforts made to educate senior leaders and train staff (Sahney and Warden 1991). 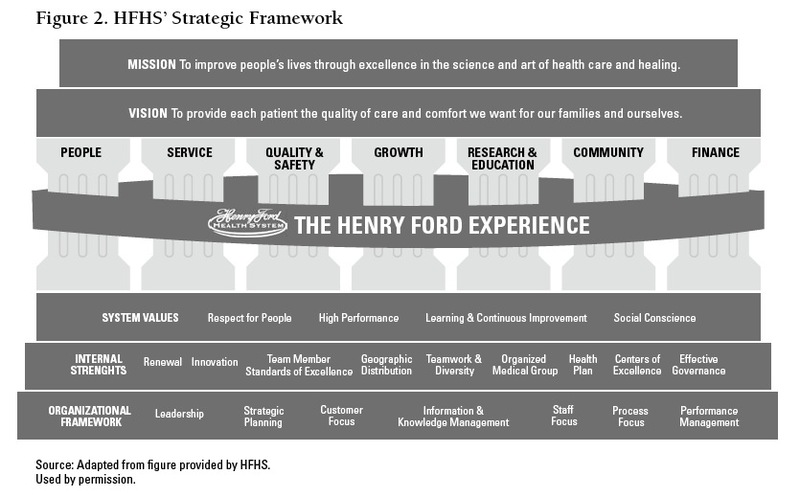 They developed a Henry Ford Quality Management Process as well as an HFHS Quality Framework, which were merged into the strategic planning process at that time (Sahney and Warden 1993). A team of Hospital Corporation of America (HCA) consultants led by Dr. Paul Batalden designed and delivered the education programs for senior leaders and trained in-house staff to continue the education rollout throughout the organization. A Managed Care College was set up in 1992 to teach clinical staff about evidence-based medicine and improvement methods; this was disbanded, however, when HFHS suffered financial cutbacks (Sahney 2003). Warden and Sahney were high-profile contributors to national quality improvement efforts in the US beginning in the late 1980s. They supported the foundation of the IHI, establishing early connections between HFHS and IHI and involvement in IHI initiatives that have continued to this day. Under their tenure HFHS participated in IHI's Pursuing Perfection program, undertaking seven projects (which went forward internally even though they did not secure external funding as formal members in phase two of the program). More than a decade of investment in improvement education and planning under the previous executive leaders preceded the current era of improvement efforts at HFHS. However, since around 2002 there has been a sharper focus and increased constancy of purpose driven by "immense pressure from external regulatory and accrediting bodies, and the emergence of both pay for performance and public reporting" (OCQS staff member). The CQO estimates that 60% of the current staff was part of HFHS during those earlier initiatives. When we asked the CEO and COO how the Warden-Sahney quality strategy differed from the current strategy, they replied that the former was "the view from 30,000 feet," whereas "now it's all about execution - the how-to." HFHS teams presently use a variety of improvement models and methods, in some cases explicit (such as Lean or rapid cycle) and in others more generic problem-solving approaches. For example, the cardiac catheterization lab director and his AMI Care team (participating in the 100k Lives campaign) used Lean process analysis to reduce the door-to-balloon time from an average of 218 minutes in 2002 to less than 90 minutes system-wide in 2005. They dissected complex activities into quantifiable steps and worked to reduce the time each step took by avoiding duplication, minimizing steps, defining roles and organizing activities in parallel. In other cases teams have selected tools from among different approaches. The physician who leads the Chronic Care Excellence initiative said that staff engaged in that initiative did not explicitly use Lean process analysis; they did, however, identify gaps, and develop work plans and revise them. He commented that certain processes are more amenable to Lean process analysis than others, and they did have some people trained in Lean methods: "Lean is more aligned with our culture than Six Sigma but the vice-president of planning and performance improvement likes some of the [measurement-oriented] tools in Six Sigma." The initiative director also said that Lean thinking works well with clinicians; however, a cultural change is needed to spread Lean system-wide. One of the project managers commented that Lean is "Six Sigma lite" and easier to adapt than Six Sigma, which needs too much fine-grained data. Members of teams participating in 100k Lives projects debated the merits of PDSA cycles as a method. Some felt it was a useful framework for learning how to internalize making changes: "When I was doing changes less frequently I thought about PDSA more; but when doing changes daily, I think less about it" (physician). In the surgical site infection prevention initiative the physician leader said they used the PDSA language and methods when discussing the changes and results: "Physicians are comfortable with it; it's like a study." Others thought it was less important; one physician said, "PDSA is not that necessary or important. You need to be curious and want to try different things. ... Frontline staff had lots of input. They would not recognize PDSA but they can tell you the changes they've made to care. ... We wouldn't have called it PDSA unless we had to fill out a report!" Over time, HFHS has trained people in five different quality models, but I'd be hard-pressed to identify the one we use. It's eclectic; we [in behavioural health] have pulled the best of all of them. I started with Deming and then CQI. We do a lot of rapid cycle and process mapping. We use Tap Root, root causes analysis, for things that we don't want to see happen, like elopements. Additional improvement-methods training was offered at HFHS after that initial round of courses. For example, a Q201 course on measurement was developed by the quality initiatives administrator, who has a background in statistics and experience in the automotive industry. During their self-assessment against the Baldrige criteria, the Process Focus team debated the benefits of having one system-wide quality model and methodology for promoting consistent language and training for staff. Team members agreed it could be advantageous and are considering adopting a uniform approach that is a hybrid of different methods. Physicians are leading many of the improvement initiatives at HFHS and physician leaders interviewed emphasized such involvement as a requirement for success: "There has to be institutional support but it cannot be administration-led; it has to be about patient care." Physician champions and leaders are very important. However, as one physician leader pointed out, "It can be tricky to find the right champions, as not all physicians see the big picture and understand improvement and systems. ... Even some of the local champions who are good in the initial phase can't spread the change, and you may even need a new champion for sustaining change." In the Chronic Care Excellence initiative, each care design team has a provider champion and project manager and most have physician leaders. There is, however, danger inherent in person-dependent change initiatives. For example, strong physicians led the Pursuing Perfection orthopaedics and prostate cancer projects. Those individuals then left HFHS with, as one staff member said, "that knowledge in their heads." There are several innovative initiatives under way at HFHS aimed at involving residents in quality improvement. An internal medicine physician runs a program for over 100 residents adapted from the American Board of Internal Medicine's Practice Improvement Module. Residents work in teams to collect data and design improvement plans. They vote for the project they will undertake collectively, based on selection criteria (i.e., easy and low cost, generalizable, doable within a reasonable time, measurable, innovative, producing results that will matter). In 2006 residents chose blood pressure control for diabetic patients. Because Henry Ford Hospital physicians are employees, that facility's department chiefs and heads may have more leverage than would be the case if the physicians were independent contractors. At Henry Ford Hospital, for example, changes are incorporated as part of physicians' performance expectations and reviews. The Wyandotte Hospital, in contrast, has community physicians with privileges, and its CEO said they are considered to be "customers." Another key message from HFHS' experience is the importance of local data in addition to credible external data from published studies and collaboratives. When asked what it took to improve the clinical initiatives, many staff members replied "leadership"; when probed further, they said that leadership translated into resources necessary for gathering local data. For example, a full-time OCQS staff member was assigned to do chart and record-based abstraction from the surgical site infection reduction project. Even without such resources there is a feeling at HFHS that local data are so important that the cardiac catheterization lab director and the nurse practitioner themselves go through all the ambulance run sheets, manually abstracting needed times for the door-to-balloon process for all AMI patients from all sites. The director then holds monthly meetings with all those involved, including ambulance services, to review the results and look for learning opportunities. Reflecting on past accomplishments, the director reported that he gave comparative time data back to the physicians (without identifiers), and "the competition among the type-A personalities got the numbers down." (With good humour he referred to this as "channelling constructive energy.") This physician also commented that he has clear accountability as a leader to the CQO for achieving targets on indicators such as door-to-balloon times, noting that when expectations are not met the CQO comes "knocking at my door." HFHS has been implementing electronic patient records via a system called Care Plus. To date, this has taken place largely on the ambulatory side. HFHS is now designing the system for use on the in-patient side, an innovation that will include computerized physician order entry. In addition, there is already an electronic radiology records system in place. The chief of anesthesiology said his department does not yet have electronic anesthetic records because none of the current systems are good enough and "they will have only one chance to get it right." He also noted that such a system does not provide all the answers for all problems, nor would it have helped with all the detailed data they needed for the surgical wound infection reduction project. The director of the anticoagulation clinic initiative said his team "began with paper records but that would have made the changed processes unaffordable. The computerized results software helped move things along." Likewise, the e-prescription initiative in the Chronic Care Excellence project has been a successful information technology-related undertaking. The electronic records system facilitates integration and coordination of patient care across HFHS. OCQS staff reported the electronic records help with reminders, provide better data and enable more efficient data collection and reporting. HFHS staff members are involved in a large number of improvement projects; as one team member noted, "There is a lot going on." At HFHS there is a strong impetus to participate in external initiatives such as the IHI's 100k Lives campaign: "You could not not do it," said one staff member. This drive exerts additional pressure over and above the regulatory compliance demands outlined earlier. One physician described her frustration with this situation: "JCAHO [accreditation body] makes us go through hoops but hasn't made us improve. If you really want to change, it has to come from within. JCAHO just makes us document stuff." Not all front-line staff members are adapting quickly to the changes. OCQS staff reported "some push-back and resistance from some of the staff about the amount of stuff we are throwing at them." A few project team members expressed some frustration about the sometimes conflicting demands placed on them by the large number of projects (described as a "hodgepodge"), which often involve competing standards or protocols that need to be reconciled. "We have to package it for staff so that they don't see it as random acts of change," a team leader pointed out. One physician noted that although the 100k Lives initiatives had positive impacts on patient outcomes, staff members had not seen any of the changes decreasing the nursing or pharmacy workloads. People in supporting roles talked about the challenges of trying to work with all the project teams, on one hand, encouraging engagement of as many staff members as possible in improvement work ("lighting a thousand candles") but on the other, trying to manage the logistics of the resulting "thousand points of light." Many clinical leaders of initiatives emphasized the need for dedicated human resources to do the work, such as project managers, data collectors, quality support personnel and, in some instances, clinical positions. Corporate quality support resources are spread a bit unevenly among HFHS' projects, and the improvement skill and knowledge levels at the sites are somewhat variable. Given the number of improvement projects, improvement support staff commented that it was not yet clear how all the grass roots-level efforts aligned with the corporate strategy: "There are too many [projects]; we need to focus. They don't all line up in the same direction but they line up better than they have ever lined up [before]." In the present competitive healthcare environment - characterized by external report cards and pay-for-performance exerting pressure on organizations - a number of people felt that HFHS had little choice about participating in a large volume of quality initiatives. In that regard the system's patient satisfaction and service excellence work is, to some extent, market-driven. HFHS' motto is "We're Henry Ford. We can." (See https://www.henryfordhealth.org/.) In accord with that motto the organization has a reputation for excellence and a can-do improvement culture, which is illustrated by one team member's observation, "We don't ask, 'Why should we?' anymore. We ask, 'How can we?' ... Leadership sets the expectation - by setting goals and putting their money where their mouth is - that we will do it." But this reputation comes at a cost; it requires the intense, sustained efforts of many staff members. The internal drive to apply for all the external awards possible is such that OCQS staff would like to have a professional writer's help to prepare the application documentation. Members of many of HFHS' project teams expressed concern about the sustainability of the improvements they were implementing. The Chronic Care Excellence team members were not sure how the redesigned care processes would be embedded. When asked what it was like working on their different projects, one member of a 100k Lives team said, "It was gruelling." He was promptly corrected by a chorus of colleagues exclaiming, "It is gruelling!" Team members are struggling with how to engrain changes while helping staff members cope with information overload. The groups emphasized the importance of ongoing monitoring and feedback to staff: "You have to do it each day, each shift. ... We have to keep reinforcing, because it's not habit yet." One physician project leader spoke of the need for "hurricane-proofing" the change initiatives against the inevitable next cycle of budget reductions and staff cuts by seeking firmer financial support to protect human and other resources. Almost 20 years ago the previous HFHS administration launched the initial TQM efforts by making investments in resources and training. These investments generated numerous improvement initiatives that met with varied degrees of success. This experience may have contributed to the system's current performance improvement capabilities. HFHS' current leaders (who took over in 2003) are pursuing a top-down strategy of aligning and integrating the diverse activities and structures that constitute the system. Service excellence in all aspects of operations is the focus of wide-ranging organizational development efforts that involve staff and are aimed at promoting consistent cultural change. Improvement is monitored through balanced scorecard-like reports with performance measures for each of the strategic plan's seven key foci. Cascading communications are used extensively to engage staff members in discussion of service excellence and how their individual and unit activities link with corporate goals. Physicians lead HFHS' many clinical improvement initiatives. The system's improvement and project management staff provides support while also responding to external regulatory and reporting requirements. Clinical project leaders emphasize the importance of locally gathered data and the development of information systems capable of providing outcomes data. This wide array of clinical improvement projects is achieving positive results. At the same time, however, it presents several major challenges. Chief among those hurdles are finding ways to adequately support all the efforts and ensure that all the individual projects align with HFHS' goals. Project leaders also expressed concern about the sustainability of improvement efforts and the need to protect resources in the event of future financial constraints. Assigning responsibility for antibiotic administration to the anesthesiologist. Changing policies around antibiotic discontinuation. Removing all razors from the preoperative areas. Converting all skin preparation to chlorhexidine. Improving glucose control in the surgical ICU and the OR. The effort led to a more than 50% reduction in surgical site infection rates including a 19-month period with no vascular surgery infections. Today, each surgery at Henry Ford Hospital that is monitored shows marked improvement. A steady improvement in glucose control for all patients resulting in a significant improvement in overall infection rates. The rate of glucose readings above 250 has been reduced by 85% in the ICUs. The rate of hypoglycemia continues to be the same as when the program began. The highly successful tight glucose control program at Henry Ford Hospital was recognized as a finalist for the Codman award from JCAHO in 2005. 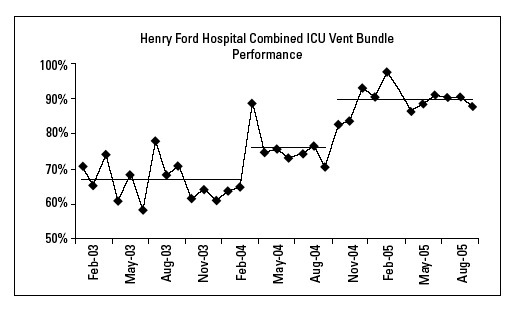 As part of the IHI critical care collaborative, Henry Ford Hospital began an effort to improve ICU care including the implementation of the vent bundle in 2003. Teams were assembled in all four adult ICUs. Patients transferred from floors on weekends were not always placed on protocols. Heads of beds, lowered for procedures, were not immediately returned to 30 degrees. Reminders didn't exist to place sequential compression devices on patients for DVT prophylaxis when heparin was discontinued. Daily weaning trials were often conducted after rounds. An average reduction of 0.9 days on a ventilator. An overall reduction of ICU length of stay by 0.65 days. For the last eight months, ventilator bundle performance at Henry Ford Hospital has been nearly 90%. Despite successful implementation of the ventilator bundle, the ventilator-associated pneumonia rate remains near national average rates. In recent months, the hospital has focused on aggressive oral care and a pilot program of using mouthwash containing chlorhexidine. Initial efforts to reduce bloodstream infection rates by switching to chlorhexidine skin prep and developing a line kit with all required materials were offset by the introduction of a valve-based, needle-less system. 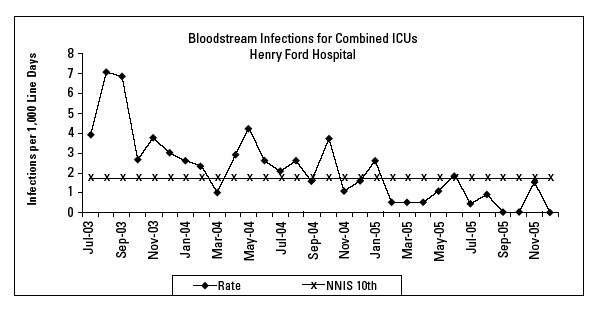 Bloodstream infections in the ICUs over the last 11 months at 0.68 per 1000 line days compared with an NNIS 10th percentile of 1.7 per 1000 line days for major teaching hospital ICUs. Line placement audits show compliance of 97% in our latest audit. An interactive CD ROM to improve medical education related to central lines. A simulation-based training program for all medical staff. Development of a line placement team to ensure a high level of experience. Focused education on line maintenance with audits of nursing practice. 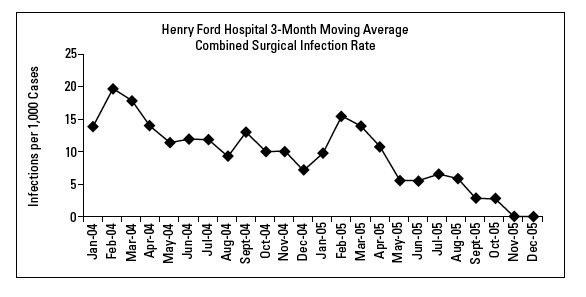 In September 2005 Henry Ford Hospital ICUs had no bloodstream infections. While we celebrate this special achievement, we are working hard to make it the norm. Improvements with AMI care have focused on the care bundle as well as reducing the time between when a patient enters a Henry Ford facility in metro Detroit until the patient undergoes cardiac catheterization at Henry Ford Hospital. As a tertiary facility, Henry Ford Hospital is the primary referral site of all AMI patients for three emergency departments within ambulatory centers and several community hospitals. 33% reduction in patient arrival at a facility to catheterization time at HFH with a median of 93 minutes in 3rd Quarter 2005. 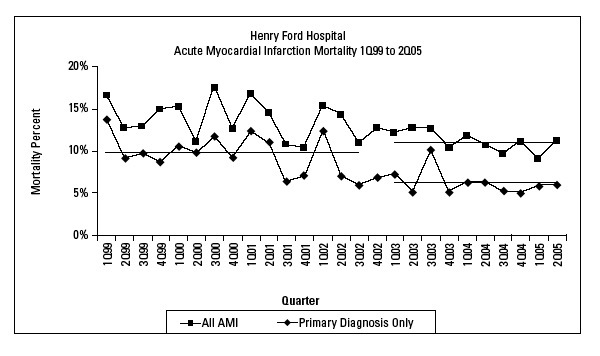 22% reduction in all AMI mortality at HFH since 2002. 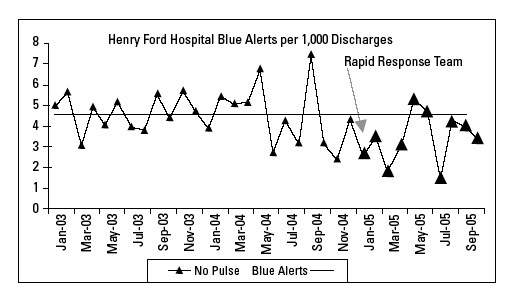 Rapid response teams have been one of the most successful improvements to Henry Ford Hospital. Responded to over 1,200 calls. Reduced the blue alert rate by 30%. Reduced hospital length of stay by 0.2 days. The rapid response team has been a huge success and has been equally well-received by residents and nurses. Henry Ford Hospital uses a single nurse responder combined with a concurrent page to the resident assigned to the patient. If the care needs to be escalated, the ICU fellow will be contacted. This model appears well-suited to a teaching hospital environment. Initial concerns about the team interfering with the medical education process have all but disappeared. Residents have found that having extra resources available to watch over the highest acuity patients allows them to take more aggressive action without over-burdening the responsible nurse. The rapid response team can help allow a nurse to keep up with his/her other patients. The success of the rapid response team has been a support to nurses as well as means to observe nursing practices. A report from the rapid response team on nursing practice issues is an agenda item at every Nursing Practice Council. This input has been used to focus efforts on skills validation. The ultimate success is determined by mortality. 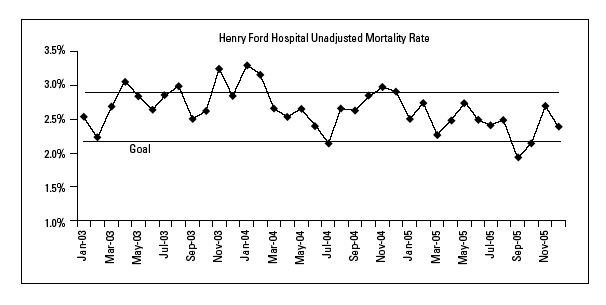 In 2005, Henry Ford Hospital has saved an estimated 190 lives. Improvements in surgical infection prevention avoided an estimated 134 surgical infections since June 2002. Henry Ford Health System. 2006. Continuing the Winning Streak: The Henry Ford Experience 2006 [Video presentation and guided discussion]. Detroit: Author. Mohr, J.J. and P.B. Batalden. 2002. "Improving Safety on the Front Lines: The Role of Clinical Microsystems." Quality and Safety in Health Care 11: 45-50. Sahney, V.K. 2003. "Generating Management Research on Improving Quality." Health Care Management Review 28(4): 335-347. Sahney, V.K. and G.L. Warden. 1991. 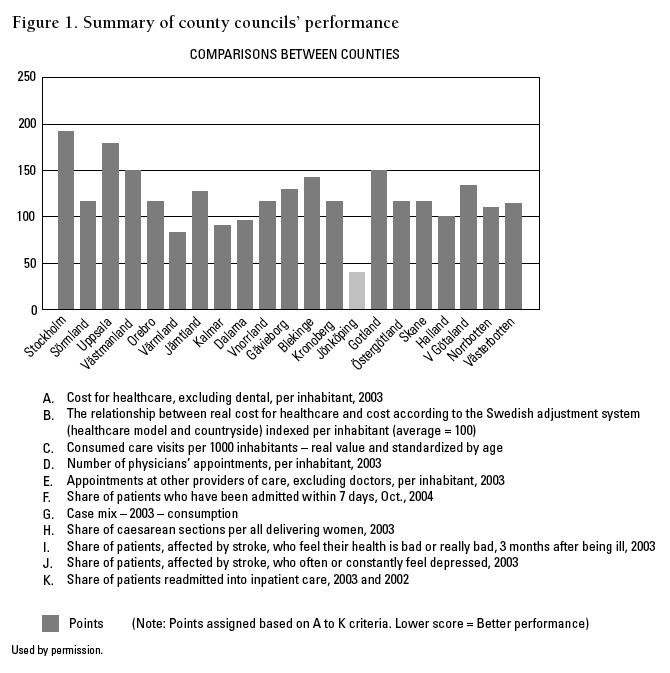 "The Quest for Quality and Productivity in Health Services." Frontiers of Health Services Management 7(4): 2-38. Sahney, V.K. and G.L. Warden. 1993. "The Role of CQI in the Strategic Planning Process." Quality Management in Health Care 1(4): 1-11. Wilson, L. 2006. "High-Octane Hospitals." Modern Healthcare 36(18): 24.